Chad Griffin is a traveling man, touching down in key states to rally campaigns the Human Rights Campaign has prioritized for the Nov. 6 midterms, including several in Southern California. After the 2016 election, HRC set up a “war room” to fight defensively for equality “non-stop.” But HRC also changed tactics. “We said we’re going to invest and have the largest grassroots expansion in our history—on the offense,” HRC President Chad Griffin tells the Los Angeles Blade as he drives to a Gil Cisneros campaign event in Brea. That meant prioritizing races, putting organizers on the ground in key districts and states, including a full time staff in California. “You can safely say we’re making six-figure expenditures” in the prioritized California districts. 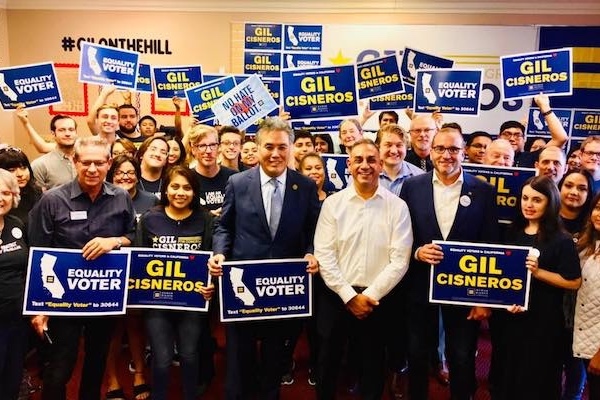 The strategy is to energize the estimated million-plus LGBTQ eligible voters in California. Using exit polling/turnout data and 2016 Gallup data, HRC concluded that “the California LGBTQ voter number is an estimated 1.4 million eligible voters,” Griffin says. And that number is low, considering how many voters do not come out to strangers asking exit polling questions. Plus, research on millennials indicates that between 15-20% of millennials identify as LGBTQ. See HRC’s Voting Center here.